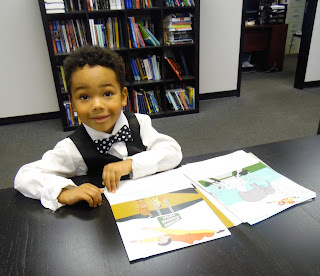 Kid Time Enterprises, LLC: You may now pre-order "Tyler Goes Around the World!" You may now pre-order "Tyler Goes Around the World!" I have exciting news to share! I visited the printer and saw the machine that will finish producing 300 copies of my first book. I learned about how a book proof looks and participated in approving the final product I will sell. I am learning so much about how to stick to a budget, saving money, working with freelance professionals and marketing. This project has required hard work and patience from me, but it is also rewarding to create a story that promotes diversity. There are so many tough things going on in the world, but I want people to remember that it is okay to be different. It's fun to travel to meet new people from all over the world. When I transform into a superhero, I feel happy to imagine making new friends, while learning what life is like where they live. 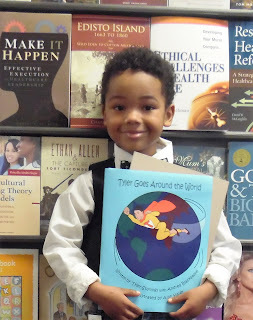 Before I go, I want to let you know that you may now pre-order "Tyler Goes Around the World." If you want to reserve a copy, please use the PayPal button on this website to make your payment. The price of the book is $17.99, but shipping is additional. When the project is released this summer, I am going to sign each limited edition hardcover book. When you purchase a copy, you will also help me to raise money for my Give Back to Veterans Day project. If you missed what I did before Easter, please read about it by clicking here. Next time, I want to buy something extra special for homeless veterans before Christmas. I believe the gift will be extremely useful to help them to meet their goals. Please continue to follow my journey and I will share more about my Christmas plans later. I will need your help and support. Will you join me to raise awareness about veterans in need? Thank you for supporting a little kid with big dreams! Have a fantastic day.